You may find over 45 different blackjack games in Microgaming online casinos in download package alone plus you can play instant Flash based variants of the most popular blackjack games; some casinos offer blackjack on mobile platform. 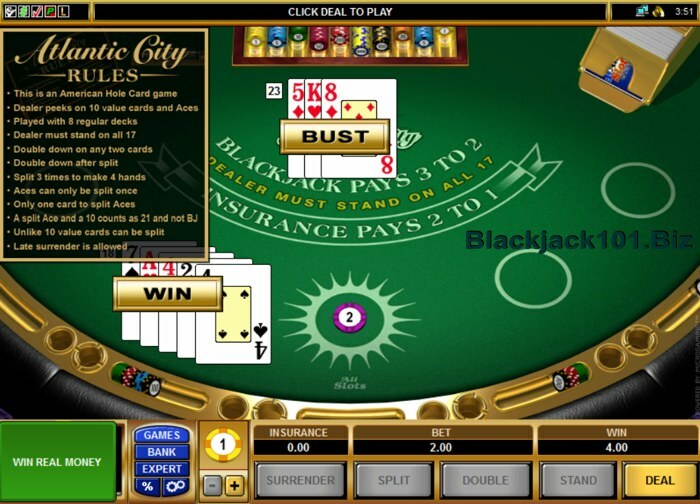 The 45+ games includes standard variants such as Classic Blackjack, Atlantic City Blackjack, European Blackjack, and more, plus multi-hand (play up to 5 hands at a time) variations of the same games. Moreover this number includes the new Gold Series variations with enhanced features and graphics. This means that you will always find a new online blackjack game to play, with its own rules and strategy. 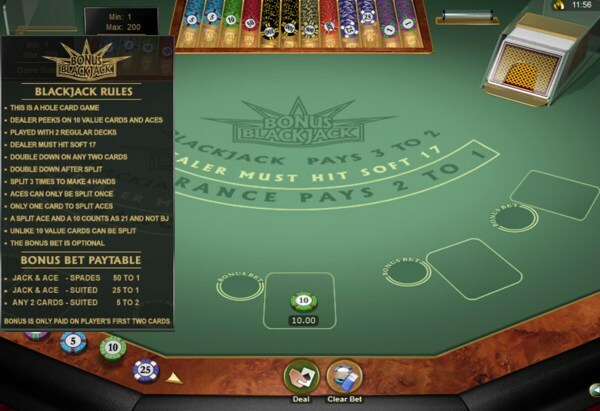 The game that people think of as regular blackjack itself comes in many variants depending on the number of card decks used: single-deck blackjack games and games played with two, four, five, six or eight decks. In some blackjack games the dealer hits on soft 17, in others he stands. 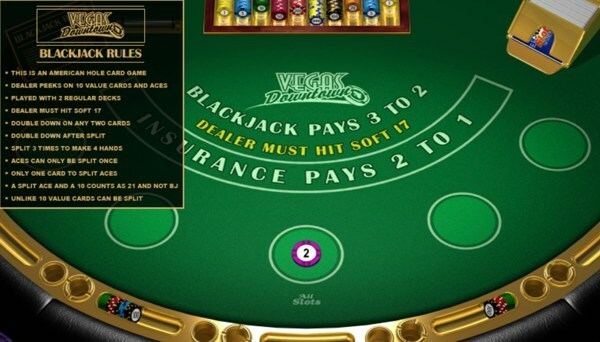 There are also other variations in the rules of the Microgaming blackjack games concerning Splitting, Doubling Down, Insurance and Surrender policy. Atlantic City Blackjack Review. This is an American Hole Card game with 8 card decks. The dealer stands on all 17. The dealer peeks on 10 value cards and Aces. You can double down on any 2 cards; split up to three times up to 4 hands (but split Aces only once). Late Surrender is allowed. Unlike 10-value cards may be split; split Aces receive only one card. A split Ace and a 10 value card counts as 21 and not a Blackjack. Double down permitted after a split. Double Exposure Blackjck Review. This is a blackjack game where both Dealer's cards are shown face up. Played with 8 card decks. The dealer hits on soft 17. The dealer wins on all ties except for a tied Blackjack. Player's Blackjack beats Dealer's BJ and pays even money (that's not great). You can double down on hard 9, 10 and 11 only. Double down permitted after a split. Split up to three times to make 4 hand. Aces can be re-split. Split Aces to receive only one card. Unlike 10-value cards may be split. A split Ace and a 10 velue card counts as 21 and not a Blackjack. European Blackjck Review. Played with 2 regular decks. No surrender; no insurance. The Dealer stands on soft 17. Double down only on hard 9, 10, or 11. Split only one time. Unlike 10-value cards can not be split. Hit on split aces. No double down after a split. The dealer does not receive a hole card; instead, he receives his second card after you have played your hand. There are also High Streak and Hi Lo 13 European Gold Series blackajck games with special features and the similar rules, and Multi-Hand 5 Deck Game. Spanish Blackjck Review. Spanish 21 is played with 8 unique decks of 48 playing cards without 10 (Ten) cards. Player's 21 beats any dealer's hand! 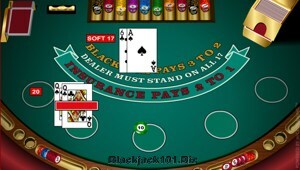 Player's Blackjack beats a dealer's Blackjack. Dealer hits on soft 17. You may double down after a split. Double down on any number of cards. You may surrender half of total bet after doubling down. A five-card 21 pays 3:2, a six-card 21 pays 2:1, a seven+ card 21 pays 3:1. A 6-7-8 or 7-7-7 of mixed suits pays 3:2, of the same suit pays 2:1, and of Spades - 3:1. Vegas Downtown Blackjck Review. Played with 2 card decks. No surrender. The dealer hits on soft 17. You can double down on any two cards. Split up to 3 times (but split aces only once) to make 4 hands. Unlike 10-value cards may be split. Split aces receive only one card. Double down permitted after a split. You can play 4 Vegas Downtown Blackjack versions, including this single hand, multi-hand and 2 Gold Series games. Vegas Single Deck Blackjck Review. One deck. No surrender. The dealer hits on soft 17. Dealer peeks for blackjack on 10 value cards and Aces. You can double down only on your first two cards with a value of 9, 10, or 11. Split only one time. Unlike 10-value cards may be split. Split Aces receive only one card. No double down after split. 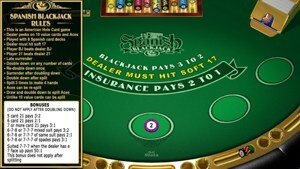 You can play 2 Microgaming single deck blackjack games, check out Classic Blackjack Gold. Vegas Strip Blackjck Review. 4 card decks. No surrender. The dealer stands on soft 17. Double down on any two cards. Split up to three times to make up to 4 hands (but split aces only once). Unlike 10-value cards may be split. Split aces receive only one card. Double down permitted after a split. You can find 4 Microgaming blackjack games with Vegas Strip rules, check out also Milti-hand and Gold Series versions. 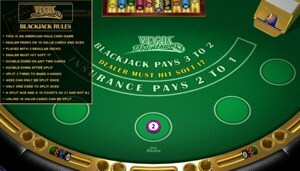 The Blackjack Gold Series represents a range of the ultimate online games that take Internet gambling to new levels in terms of smooth and speedy play, realistic graphics, digital sound and the valuable player aids, unique features and tools resident in the Microgaming's Viper online gaming software platform. New features include a refined table perspective, precision graphics, enlarged chip tray, an animated chip selector, rollover rules and ambient background sound, all enhancing the realism of your favourite games. Bonus Blackjck Gold Review. In early blackjack history, a Jack & Ace of spades won a special 10-to-1 jackpot. Bonus Blackjack Gold makes it 5 times better, with a 50-to-1 jackpot. This is an American hole card game where the Dealer peeks for Blackjack when he is dealt a 10 or an Ace. 2 card decks. The dealer stands on soft 17. You may double on any first 2 cards. You may double after a split. Split up to 3 times to make up to 4 hands. Split Aces only once. Insurance is available. Bonus side bet pays 50:1 for Jack & Ace of Spades, 25:1 for Jack & Ace suited and 5:2 for any 2 suited cards. Classic Blackjck Gold Review. Classic Blackjack Gold is played with one deck. No dealer's hole card (no peek). Dealer stands on all 17. Double down only on first 2 cards with a value of 9, 10 or 11. Split only one time. Split Aces only once. Unlike 10-value cards can not be split. Hit on split aces allowed. No double down after a split. No surrender. Insurance is available. 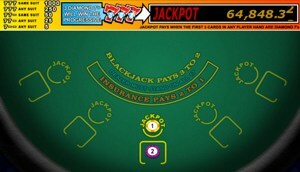 Microgaming casinos offer 2 Classic Blackjack Gold games with single hand and multi-hand options. With a proper strategy this game offers one of the lowest house edge of just 0.13% plus you can try to take advantage of the card counting. High Streak European Blackjck Gold Review. High Streak Blackjack awards special bonuses for winning streaks when you win two, three, four, or five games of blackjack in a row. 2 card decks. Dealer stands on all 17. Double down only on 2 cards with a value of 9, 10 or 11. You may double after a split. Split only once. Player may draw multiple cards to split Aces. No surrender. No peek. No hole card: player loses total bet if the dealer has Blackjack. If you win your hand, the High Streak feature is triggered, with the first High Streak win paying 1:1, the second consecutive High Streak win paying 2:1, the third 5:1 and the fourth at 10:1! Hi Lo 13 European Blackjck Gold Review. 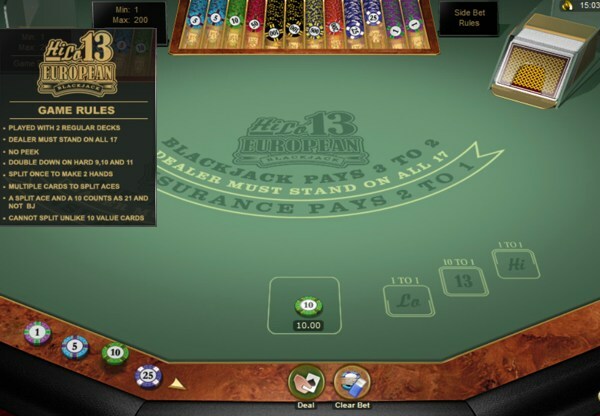 Hi-Lo-13 is European Blackjack game with a side bet on whether the total of your first 2 cards will be higher than 13, lower than 13, or equal to 13. You can make one or more bets; if you bet wins you are paid: 1:1 for 'Hi' & 'Lo' bet, and 10:1 for correct '13' bet. 2 card decks. Dealer stands on all 17. Double down only on first 2 cards with a value of 9, 10 or 11. You may double after a split. Split only once. Draw multiple cards to split Aces. No surrender. No peek. No hole card. Perfect Pairs European Multi Hand Blackjck Gold. The Perfect Pairs side bet pays out a bonus jackpot every time you get a pair, and it pays even more if you get a perfect pair - 30:1. Colored Pair pays 15:1 while Mixed Pair pays 7:1. Base game has European rules, played with 2 card decks. Dealer stands on all 17. You may only double on hard 9, 10 and 11. You may double after a split. No re-splitting (1 split only). Player may draw multiple cards to split Aces. No surrender. No peek. No hole card game. Spanish 21 Multi-Hand Blackjck Gold Review. This game is played with 8 unique decks of 48 cards made up of the standard 52 cards, less the four 10 (Ten) cards. Dealer hits on soft 17. Double down any number of cards. Double down after a split. You may surrender half of total bet after doubling down. To make up for the missing 10s, Spanish 21 Blackjack awards special bonuses for certain card combinations: A five-card 21 pays 3:2, a six-card 21 pays 2:1, a seven+ card 21 pays 3:1. A 6-7-8 or 7-7-7 of mixed suits pays 3:2, of the same suit pays 2:1, and of Spades - 3:1. Optimal strategy lowers a house edge to 0.38%. 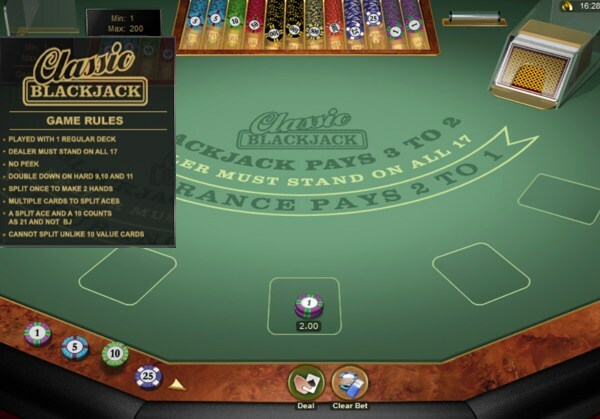 Beyond the standard blackjack variations, Microgaming online casinos offer some really special blackjack games that go far beyond anything you have experienced at a standard table. The games have extra unique features that may bring you additional healthy payouts. Triple 7's Progressive Blackjack Review. 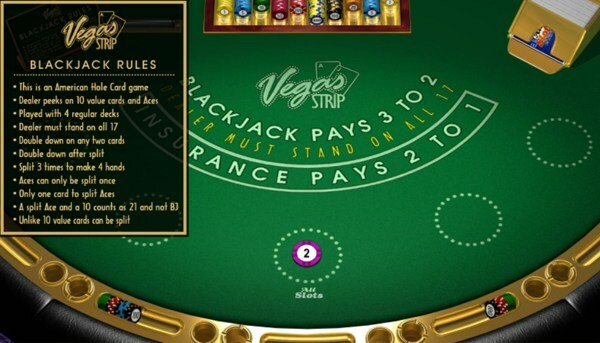 Triple Sevens is the wildest online blackjack game of all. It has a progressive jackpot that gets bigger every time someone plays this game online. Get 3 diamond 7s, and it's all yours, 777 same suit pays 1000 credits, 777 any suit pays 250 credits, etc. 5 card decks. Compulsory 1 credit side bet. The dealer stands on all 17. You can double down only on a hand of 9, 10, or 11. Unlike 10-value cards can not be split. The odds turn in player's favour when the progressive jackpot grows to 6 digit figure. Super Fun 21: Super Fun 21 is a super fun online blackjack game that pays out bonus jackpots for a five-card 21 and a diamond blackjack. 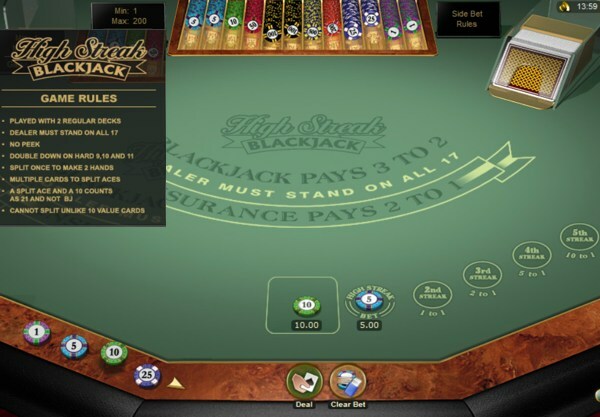 High Streak & Hi Lo 13 Blackjack Games: Blackjack is often a game of streaks. High Streak Blackjack awards special bonuses up to 10 original bets for winning blackjack streaks when you win 2, 3, 4, or 5 games of blackjack in a row. 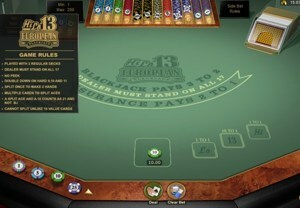 Hi-Lo-13 is European Blackjack game with a side bet on whether the total of your first two cards will be higher than 13, lower than 13, or equal to 13. Your extra payout can be up to 10 original bets. 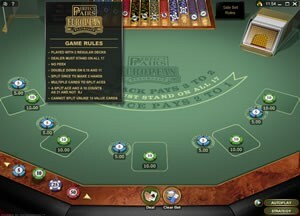 Perfect Pairs Blackjack: In the Perfect Pairs blackjack games, the optional Perfect Pairs side bet pays out a bonus jackpot every time you get a pair, and it pays even more if you get a perfect pair - up to 30:1. Pontoon: Pontoon is UK-style blackjack game with its own special vocabulary, and a bonus for a "5-card trick." 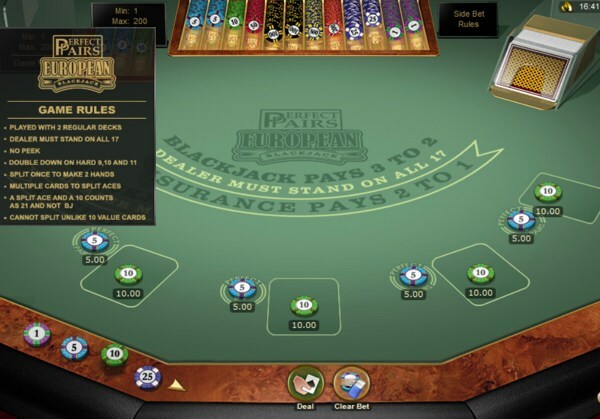 Blackjack Ballroom is one of the recommended Microgaming casinos offering blackjack games including Single Deck classic blackjack where you can keep track of the cards and estimate your chances via card counting. However, the cards are reshuffled after every round that makes it quite difficult. The house edge is about 0.13% which is incredibly good. Blackjack Ballroom Casino also offers all the multi-hand blackjack versions with the same rules as those for single hand games. Betting limits are $1 to $1,000. 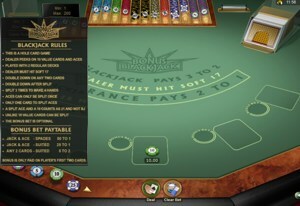 In Blackjack Ballroom's single deck classic game you can play only one hand at a time. The dealer must stand on A-6 which is standard. Doubling down is allowed only on 9, 10 and 11. You are not allowed to double down after you split a pair though. You may split pairs to 2 hands only. Split Aces may be re-hit, which is a very good. The dealer does not check for Blackjack until you are finished, so if the dealer does have a Blackjack then you will lose the total bet, including any additional money from doubling or splitting, which is very tough for the player. No surrender. 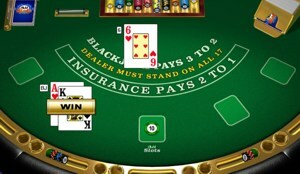 Insurance is offered if you think the dealer might have a Blackjack. 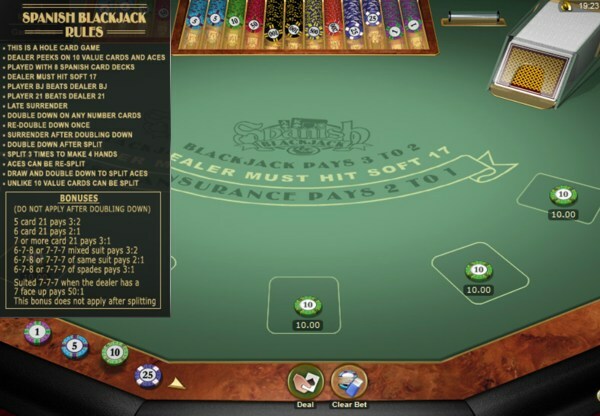 You can keep general strategy while playing at Microgaming online casinos or, better, see our optimal strategies (with strategy cards) for most of the MGS Blackjack games (see left menu). With the new Viper software you can play in Expert Mode and get help when you should draw... Some other Microgaming casinos offering all Blackjack games: 32Red Casino (320% bonus up to £/$160 free) or Casino Action (up to $1,250 in signup bonuses). 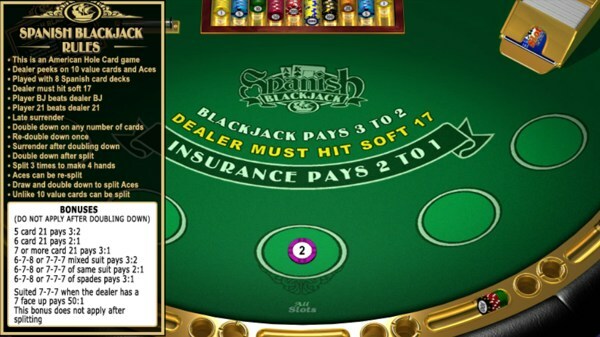 Blackjack Ballroom offers match bonuses on your first 3 deposits up to $500 free and high betting limits.